26 Nov 2013 - Batikap Release Forest has become a testament to orangutan family life! New orangutan mother Monic is protecting and showering her baby Messi with tons of love all day, every day. Meanwhile, Markisa, who has two beautiful daughters, has watched her eldest daughter Manggo move on to live more independently. 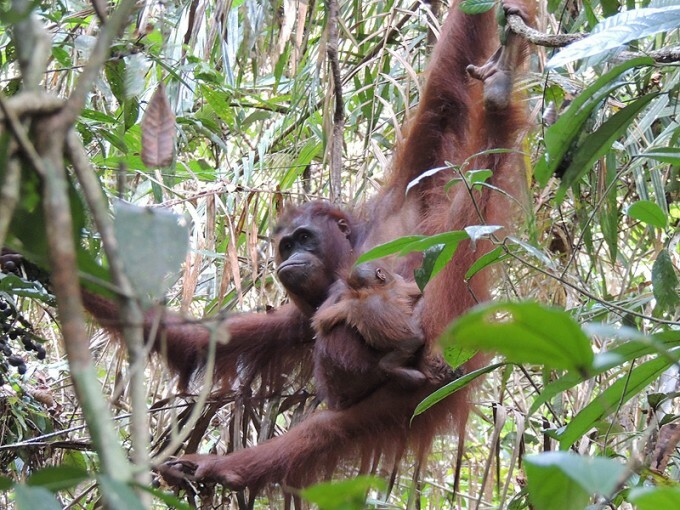 Matilda, another orangutan mother, is busy teaching her eldest daughter, Astria, to build a nest. And how about Lesta’s family showing up after 8 months roaming the marvelous Batikap? Since Monic went into labor, the post-release monitoring team has been supervising and checking her condition every three to four hours daily in order to ensure that both mother and baby are continuing to progress. The observations are undertaken carefully so that neither mom nor baby become stressed from seeing so many people around them. Monic has been literally showering her baby Messi with love-- frequently cleaning his hair by licking it. When she's eating Monic will cover Messi with leaves or sit behind a big tree trunk protecting him. 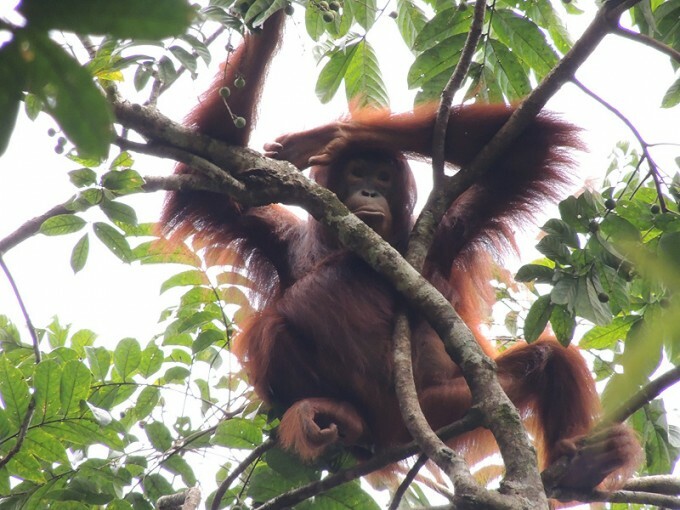 Manggo, who is now 8 years old, is growing up and becoming increasingly independent. Since August, this young female orangutan has been carrying out most of her daily activities on her own, apparently enjoying herself without needing to constantly be near her mother Markisa and her baby sister Uli. Manggo is no longer the little girl who always wanted to be with her mom. She's almost all grown up! One day, while she was eating sangkuang by the River Joloi, Manggo met Markisa and Uli who happened to be feeding and travelling in the same area. Seeing her first daughter eating, Markisa slowly approached her. The family got back together but each of them was still mainly focused on their own activities. 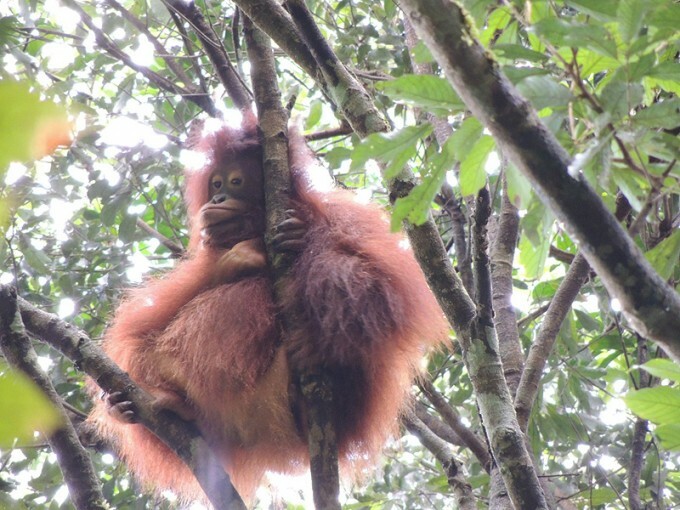 While Markisa has been watching her daughter, Manggo, begin to grow up and live and forage on her own, mother Matilda is still teaching and nurturing her young daughter Astria. She is Matilda’s first daughter and still needs helps from her mom to find food and build nests. Astria will continue to learn from her mother in coming months and years... and will someday be an independent orangutan. Based on direct observations, the monitoring team has noticed that Astria is still using her old nest to sleep. An orangutan normally builds a new nest every night. Sometimes Matilda helps Astria by repairing her old nest so that she can sleep comfortably. Matilda usually builds her nest close to her daughter’s. She's patiently teaching Astria how to build her own nest. In addition to learning from her mother, Astria also loves to play with her baby sister, Georgina. Astria is always happy to be around her family and doesn’t seem to ever want to be too far from her mom and baby sister. Sometimes Matilda goes to the ground to find food. In moments like these, Astria stays high up in the trees. She doesn’t like to play on the ground and is afraid of humans. Smart girl! The wait is finally over! On October 2, 2013, Lesta and Lewis were found along the banks of the Joloi River heading to the Monnu area. They looked healthy and were actively looking for food-- a very good sign! The monitoring team saw Lesta eating young suli (Zingiber sp.) leaves, rattan and seluwoi. Lesta came down to the ground several times to find more food. Whenever she came down, Lewis was always tucked in his mother’s arms. But whenever they were high up in the trees, Lewis was confident enough to play by himself. Lewis was actively swinging among tree branches and is now very active in choosing and learning about natural foods from his mother. He copies everything she does, including trying lots of new foods! Lewis, who was born on Kaja Island in March 2011, seems to be adapting quite well to his new environment. When it's especially hot, he'll put leaves on his head to keep cool. He shows this trick to his mom and, as if to make him happy, Lesta will imitate it. Lesta loves her son so much! Although she lets him play by himself, she is always watching him from close by when he is playing... just to be sure he is safe! What a wonderful mother! View the original post on the BOS Foundation website.